Chicago got its origins as a hub between the East and the West back in the 1800s, and for the NHRA, at least, it’s still serving the same purpose. It’s the site of this weekend’s K&N Filters Route 66 NHRA Nationals, the final stop before the famed Western Swing. That must mean that the regular season is already winding down, and indeed it is, with only six events remaining before the Countdown starts. That means for some, it’s getting to be crunch time. Top Fuel racer Leah Pritchett, who lost her full-time ride when Bob Vandergriff Racing shut its doors a few races into the season, is doing her best to make it to each race so she can hold on to her spot in the top 10 for the Countdown, but Terry McMillen is only a scant 24 points behind her, so it’s going to be a challenge. Erica Enders, the defending champion in Pro Stock, finds herself on the outside looking in, trailing Alex Laughlin, who sits tenth in points, by 8 markers. It’s not a big gap, but with the way this season has been going, it’s not a gimme either. 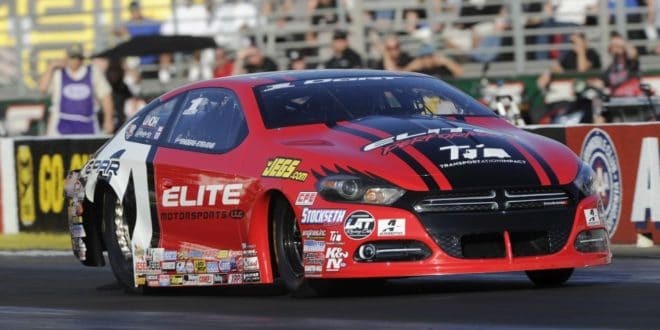 It’s not that Enders has suddenly forgotten how to drive, but her Elite Motorsports team has struggled to get a handle on both the new-to-them Dodge Dart and the new EFI package. Dart teammate Jeg Coughlin, Jr. isn’t faring much better, sitting ninth, just 30 points in front of Laughlin. Things are a bit quieter in the Funny Car ranks. Another lady holds down tenth in that class, but Alexis DeJoria his holding a little bit more comfortable margin of 143 points over 11th place Chad Head. Margins are a bit tighter the entire way through the top ten in those ranks however, with leader Ron Capps gapping her by just 326 points. Compare that to the 546 point gap to tenth in Top Fuel and the astounding 891 points separating the top ten in Pro Stock. Pro Stock Motorcycle is at exactly the halfway point for their regular season, with five events in the books, and five more to the cutoff. It’s Eddie Krawiec and Andrew Hines and the Harleys once again holding down the top of the field, but Jerry Savoie is currently sharing second spot with Hines, 166 points behind Krawiec, and Angelle Sampey is lurking just behind them both, 19 points back in fourth. More is heating up than just the weather folks, and even in Pro Stock, long ago given up for dead as far as points battles go this year, there is drama to watch as the regular season winds down. * Leah Pritchett will be on track this weekend in Chicago to continue her efforts to stay in the top 10 leading up to the championship Countdown. Pritchett originally expected to sit the event out due to a lack of sponsorship, but a last minute agreement with Albrecht’s Fast Track motorcycle repair and service saved the day. 2015 – Scored three wins and two runner-up finishes; four-time No. 1 qualifier. 2014 – Earned first career victory at St. Louis; earned first No. 1 qualifier at Sonoma. 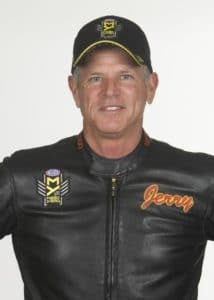 Some things most people don’t know about Jerry: We might need to rename this section to “Something pretty interesting about Jerry” instead, since this fact pops up in his sponsorship, but Jerry owns an alligator farm. His alligator farm was featured on an episode of The Discovery Channel’s Dirty Jobs when Mike Rowe checked out alligator farming. It makes Matt Hagan’s cattle ranch look a little tame though. J.R. Todd talks about his biggest concern about NHRA drag racing and what he thinks most needs to be addressed to insure the future of the sport. The amount of time, measured in thousandths of a second, that it takes for a driver to react to the green light on the Christmas Tree. The counter starts when the last amber light flashes, and is stopped by the driver crossing the staging beam to start a run. This seemingly minuscule amount of time can translate to a big gap at the finish line and can make the difference between winning and losing a race. Have a great reaction time, and you could still win the race, even if your competitor runs faster (see Holeshot). Of course, that also means that if you are not paying attention and lose time at the start, it could cost you the race even if you have the faster car. Next 2-Headed Monster: Is Plate Racing the Best Form of Racing?